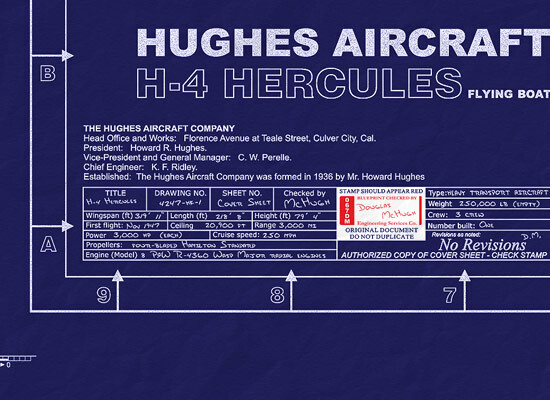 Hughes Aircraft Company was a major aerospace and defense contractor founded in 1932 by Howard Hughes in Glendale, California as a division of Hughes Tool Company. — and at the start of the war Hughes Aircraft had only four full-time employees... by the end it was 80,000. The Hercules was a monumental undertaking. The largest aircraft ever built. It is over five stories tall with a wingspan longer than a football field. That's more than a city block. Commonly known by its nickname, "Spruce Goose"
This transatlantic transport aircraft is fascinating due to its place in history, its designer Howard Hughes and how it came to fly. Hughes was required to develop the prototype without using strategic materials. —born out of a need to move troops and equipment across the Atlantic Ocean, where in 1942, German submarines were sinking hundreds of Allied ships. Continued from above… of wood, hence the somewhat sarcastic nickname of "Spruce Goose" given by its critics (ironically it was mainly built from Birch wood). Howard Hughes hated that nickname and I do not think anyone would have uttered it in his presence. The HK-1 designation was derived from the names Hughes and Kaiser. When Kaiser backed out of the project in 1944, Hughes redesignated the aircraft H-4 and, after the first flight, changed the tail number from NX37602 to N37602. Six times larger than any aircraft of its time, the Spruce Goose, also known as the Flying Boat, is made almost entirely of wood. When America entered the Second World War our geographic isolation from the areas of conflict gave us a distinct advantage over our enemies. The technology of the time simply made it quite difficult for those fighting against us to mount serious action against our homeland. But we also had to overcome the vast distances; we had to find ways to safely deliver these materials, and men to use them, to the areas of conflict around the world. At the time, ships were the only way to get the job done and the men doing it were finding that it was very dangerous work. Shipyards across America were at full production but enemy submarines were sinking the critical vessels nearly as fast as they could be built. Something had to be done. The idea for the HK-1 flying boat came from Henry Kaiser... Head of one of the largest shipbuilding firms of the time, Kaiser thought a ship that could fly over the danger might be the answer. 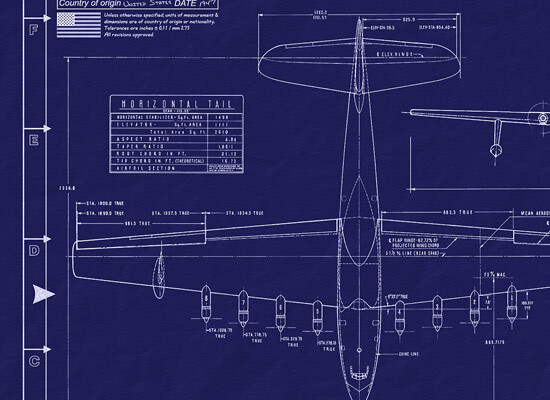 Howard Hughes was known as an innovator in aircraft construction and design. These two men, both legends in their own time, would launch the venture to build the huge craft (originally three were to be built). The new plane's official name bore the initials of the principals in the project HK-1....But to many of us it's always just been "Spruce Goose". The Hughes Flying Boat H-4 aircraft was built from wood due to the shortage of aluminum during WWII. The government contract stipulated that the flying boat not be manufactured from materials critical to the war effort. Howard Hughes licensed a process from the Fairchild Aircraft company to produce laminated wood parts for the aircraft. It was powered by eight Pratt & Whitney R-4360 Wasp Major radial engines at 3,000 hp each! 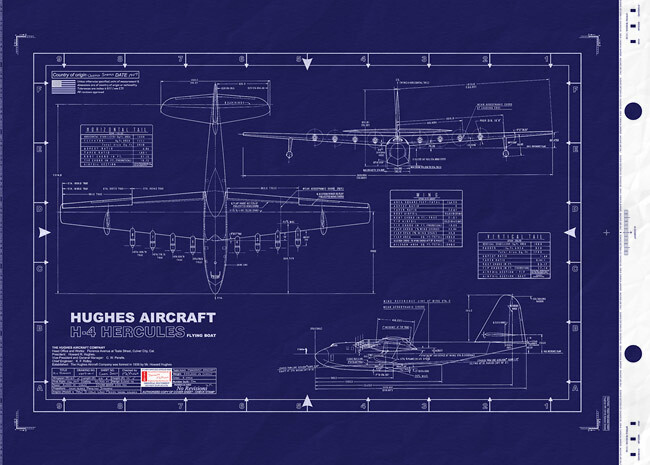 The Hughes team had to overcome a wide range of engineering problems to build the Spruce Goose. The final product is a tribute to the efforts of the team in overcoming the problems they faced. Hughes would prove to be a demanding taskmaster during the period of development and construction. His attention to detail and insistence everything on the new plane be nearly perfect, was largely responsible for both the beauty of the finished product and it's not being ready to fly until after the war had ended. The timing of completion and final cost brought Hughes and the project under the critical eye of the post-war congress, one Senator grudgingly referring to the plane as "The flying lumberyard". 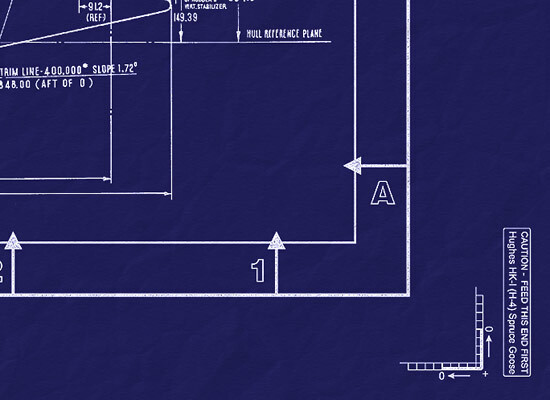 Howard Hughes was called to Washington D.C. to defend both the project and himself. During a break in the hearings, he flew back to California to conduct a test on the "Goose", it was during this test the accidental flight took place. This event, whether intended or not, put a halt to critics of the project and served as the finale for this gigantic aircraft. Though his feathers had been ruffled by the intense questioning he had endured, the flight had vindicated Hughes and the project. The H-4 Hercules, which by now would be known forever as the "Spruce Goose", was put into storage . It remained hidden from public view, carefully preserved, until after Howard Robard Hughes death in April of 1976.